Show your gratitude with a pretty fashion inspired hand-stamped card. 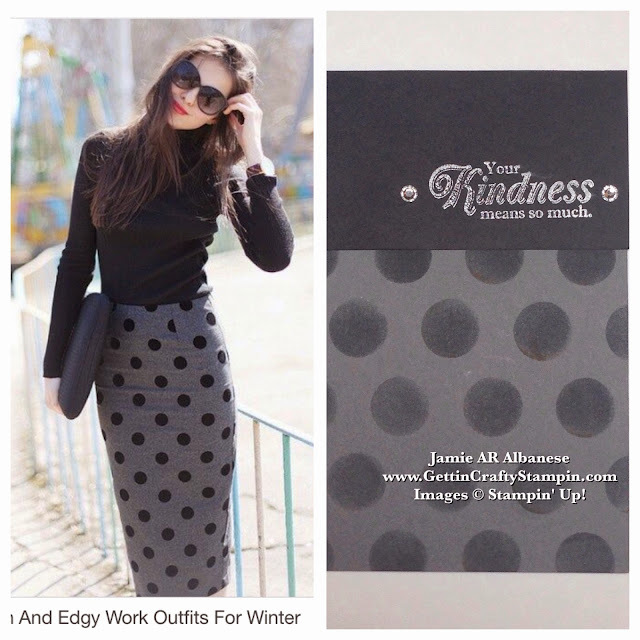 Celebrate Fashion Friday with this fun fashionable hand-crafted card making tutorial. Say good-bye to one of my favorite stamp sets (secure YOUR favorite stamp sets - up to 50% OFF on our Last Chance Retiring list!!) will score these beauties for your own collection or gift-giving. I love our Sponge Daubers - they are fun and easy to use. 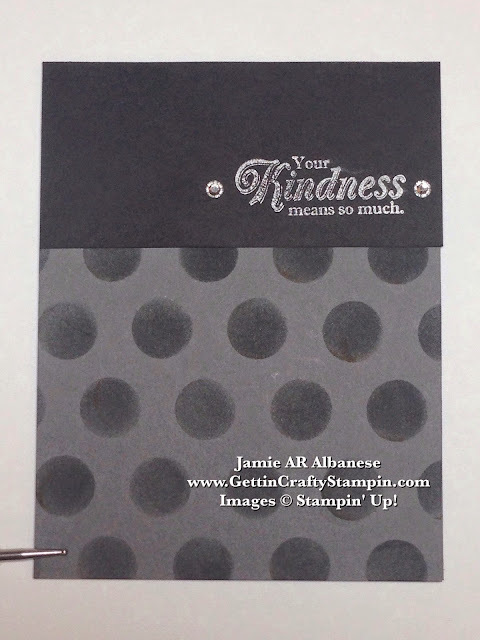 Here wanted to create a polka dot background on this Basic Grey card stock. I tried a random pattern but it just didn't work for me. 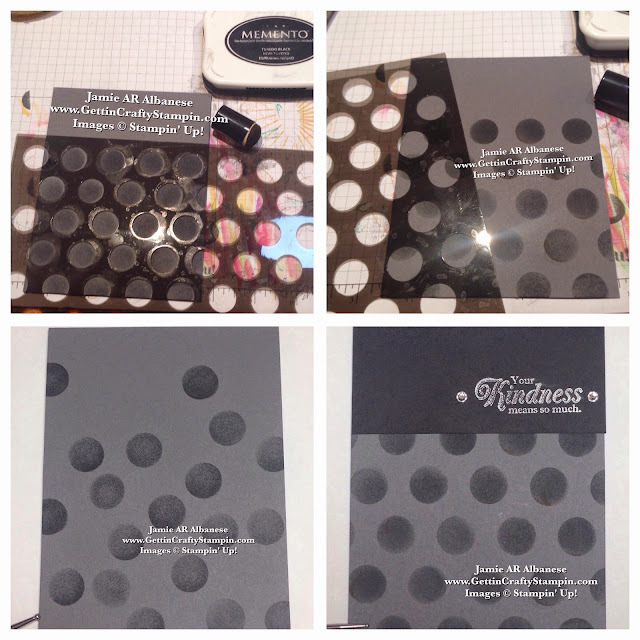 Grabbing my Dots Decorative Mask, Sponge Dauber and Memento Tuxedo Black ink pad I had a blast creating this simple and classic (but on trend) background. I love the elegant and beautiful From My Heart stamp set. I hate to see it go but am so glad that I have it for my own collection!! SCORE this stamp set (and more) as well as Papers, Inks, Accessories, Tools, etc. on our Last Chance Retiring List. Stamped here on the Basic Black card stock the Silver Encore ink, the elegant script is the perfect accessory to this easy hand-stamped card. Framed out (like a good pair of earrings - lol) the adhesive backed Rhinestone Jewels. I love the pencil skirt and it's return!! Here this is a stylish and on trend (while being classic) fashionable look. No matter where you find your inspiration - have fun and create works of art (in your hand-stamped cards) that will fashion a smile or two! 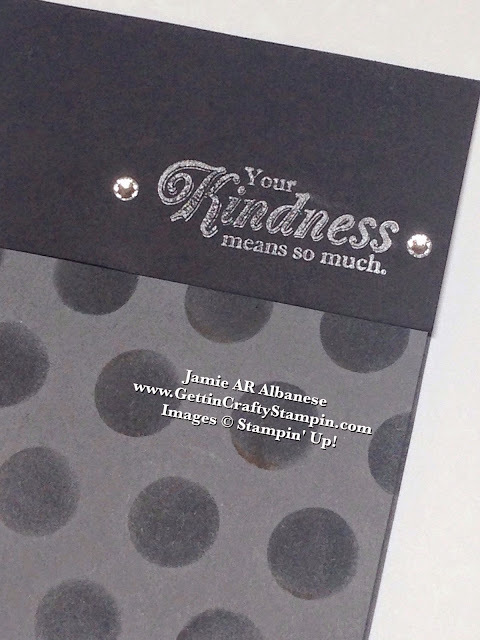 Show someone how their kindness blesses you with this hand-stamped card. Card Making is fun, can be easy and on trend. Polka dots are a classic design that is easy to create thanks to our Decorative Masks and Sponge Daubers. I love that my passion for crafting can be inspired by my love of fashion on my Fashion Friday posts. I hope that you enjoy this, leave me a comment and let me know what you think.